This beautifully designed butter dish from BIA Cordon Bleu was designed to fit 1lb of butter so you can put a 1lb block of butter right into this dish. 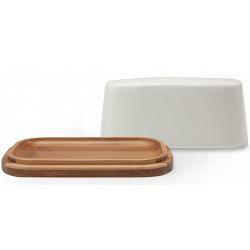 The tray is made from stunning bamboo and the lid from white porcelain. The covered butter dish measures 6.8 x 3.8 x 3.25" H / 16.5 x 1 0 x 8.5cm H and the lid is dishwasher safe.